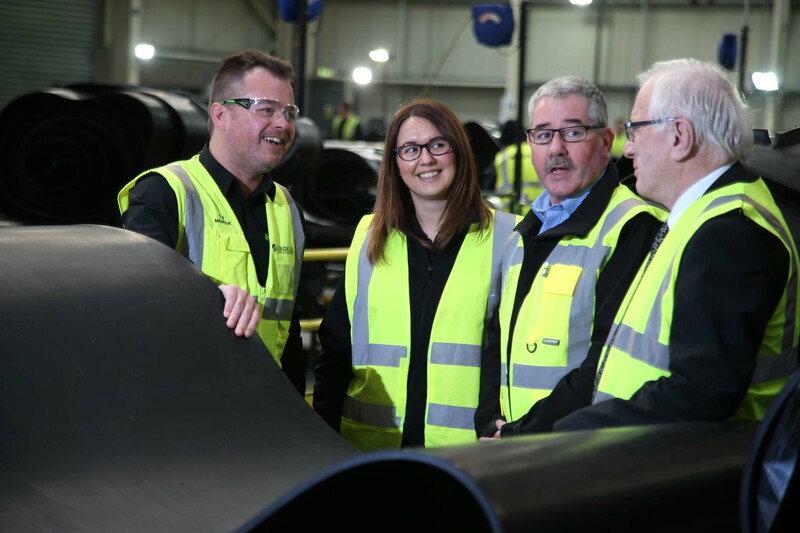 One of Lisburn's top manufacturers, Smiley Monroe, is experiencing the highest period of growth since the business was formed over 38 years ago. With a sales increase of 20% from last year (rising from £16m in 2016 to £19m in 2017) and the creation of 12 new jobs, together with projected sales to remain at 20% increase per annum, the company is becoming one of the fastest growing family-owned businesses in the Council area. Smiley Monroe produces conveyor belts and custom cut parts for manufacturers (OEMs) of mobile crushing, screening, recycling, road construction and environmental equipment in their manufacturing plant in Lisburn and as part of the continued programme of 'Made in Lisburn Castlereagh' visits, a delegation from Lisburn & Castlereagh City Council recently visited the team to congratulate them on their recent success and learn of their exciting plans for the future. Speaking at the visit Chairman of the Council's Development Committee, Alderman Allan Ewart, MBE, said: "It is very inspiring to learn about local businesses such as Smiley Monroe and their remarkable success. They have achieved significant growth not only in the Northern Ireland market but further afield in North America and right across the world, exporting to a total of 42 countries. With this growth comes new jobs, new training and investment in their employees and new technology. This is something they do so well. I look forward to watching with interest their future growth in both the domestic and export markets. They are a great example of world-class manufacturing on our doorstep and the Council will support them in any way we can." Marketing Director, Tim Monroe explains: "We are in the middle of a significant growth period and it is down to many factors including the ambition and drive of the business, the upturn in the OEM market and the investment that we are injecting into the business. We are actively seeking new markets through global trade fairs and this is paying dividends. We already have a manufacturing facility in India and we have plans to have a permanent presence in North America, where the market is set to soar. "Our state-of-the-art Hub2, located in another site in Lissue Industrial Estate, is home to our impressive water jet cutting technology which led to in an increase in production capacity and improved efficiencies. This, along with our new Enterprise Resource Planning software forms part of our wider strategy of growth. We are delighted to increase our workforce across many of the departments from marketing, technical and production. We currently have 149 employees and we are recruiting for a total of 12 newly created positions as well as recruiting for six replacement positions. Please check out our website and social media for details of vacancies." Smiley Monroe has previously participated in the Council's business support and trade development programmes and are actively engaged in the Council's Investment programme aimed at promoting Lisburn Castlereagh as Northern Ireland's premier investment location. The next event for the Council's Investment team is the annual 'Lisburn Castlereagh at Westminster' networking event set in the prestigious venue of the Terrace Pavilion, Houses of Commons. This will take place on the 18th April 2018 and will incorporate a trade programme for local companies to develop their links to GB and specifically London.